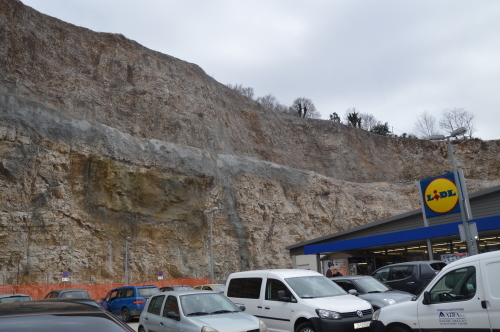 The LIDL supermarket in Pazin (Istria) has been built close to a very steep rock slope about 50 m high. The parking area is directly exposed to possible rock blocks fall. Rockfall protection and rockfall mitigation are key elements in the security and safety of infrastructure, mine works, buildings or people. Even small rock falls, or debris flows can block infrastructure and can have far-reaching economic effects beyond the immediate disruption. For this reason, it was absolutely necessary to realize a strong and effective protection. Maccaferri’s SteelGrid products are designed to protect public sites from rock falls. A local LIDL supermarket in Pazin, Croatia has decided to implement Steelgrid HR 30 PVC to assure the safety of visitors and customers. It is the best solution in term of durability and it complies with the prescription of the European Standard EN 10223-3. Maccaferri Steelgrid HR 30 PVC was chosen to feature in this project given its high performance in term of tensile strength, punching resistance and durability. In total 5.500 m2 of Steelgrid HR 30 PVC were installed on the LIDL supermarket site. The easiness of installation makes Steelgrid HR 30 PVC also a remarkable solution for the installers. The product has no equals in the market.